RIM's tablet confirmed to be real? Long before the Apple iPad was officially unveiled to the public, there were plenty of manufacturers bent on jumping the gun by making their very own tablet device to take advantage of the suspected next big product segment. Aside from the usual computer manufacturers that took the plunge, one major smartphone maker is now looking to join the ranks in this category. According to a BBLeaks connection, they're confirming that RIM is in the process of working on their very own tablet device that is rumored to be more compact than the iPad and will go by either the codenames “BlackPad” or “Cobalt.” This is pretty interesting considering that there was a rumor a while ago that RIM was ordering 8.9” displays from Hon Hai. Now the image provided is not the actual rumored device, but instead, it's a mock up what it could potentially look like. With the successful launch of the Apple iPad, it's known far and wide that there is money to be made with this specific product category and consumers are buying into it from what we've witnessed so far. Now would be the perfect time for RIM to get a piece of the pie as they're undoubtedly looking to grow their business by venturing outside the norm from their usual operating model. hjahgahahahj a DISK DRIVE?!?!?!?! when was the last time you bought a new anything with a disk drive. Jeradiah3, did you mean a cd rom drive or an sd slot? I LOVE RIM. I've been using their phones for years. But this is not cool! They don't make tablets, or computers. They specialize in corporate and consumer email and PHONES! I'll be willing to give it a shot but i'm not expecting anything spectacular or new. I may be wrong it could end up being better in some ways than its competitors, but in order to do so they will need to make some big time changes to the App World and get more developers on board and offering more free apps, because, thats what we all really want right? And it had better NOT have a sure-press screen. Capacitive with multi-touch support or it'll be an instant FAIL! yea, apple didnt make tablets... untill they did... android wasnt on tablets... until it was.. whats your point? Obivously phone OS's lend themselves well to tablets for a myriad of good reasons. 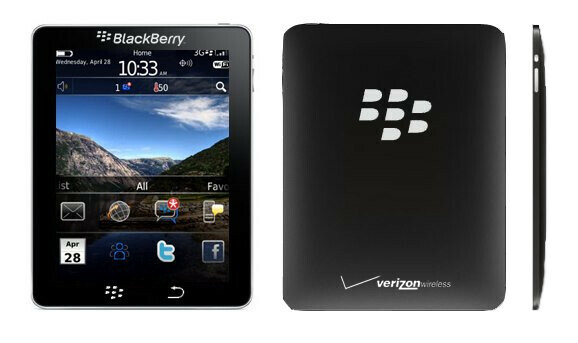 I dont see any reason why RIM cant make a fantastic corperate tablet. The only thing theyve ever been missing is a lil flash and flare and a good web browser. Do those things on top of RIMs solid email and message management, and u got a winner in my eyes. Id still take an Android based one over RIM or Apple, but id sure chose RIM over apple any day of the week. CRICKETownz got it right on point....crApple makes computers, thats what they do besides various other things. This is RIMs first shot at a tablet computer, a computer of any sort really. I never bashed the OS. But they NEED more apps, IMO, for this to take off. And NO sure-press please! Does anybody see another BB Storm catastrophy in the works? Yar. Tablets are pointless. I love my Pre, and I love my Cliq XT. But honestly, what am I going to do with a giant device that isn't a full on computer? The only people using stupid tablets are Apple fanbois cus they would use anything Apple makes. My smartphones are phones, and i'll use my netbook for anything my phones can't do. Maybe you are the gay one...usin words like "fancily". Cancel your account...please. looks fake. can't be real.